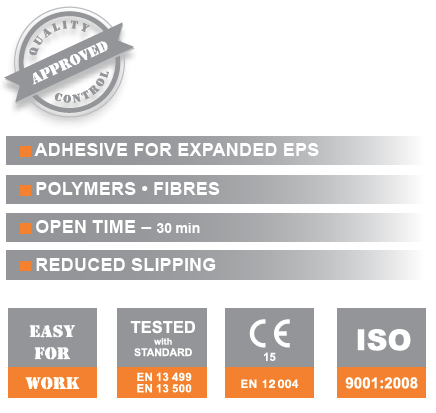 For adhesion of EPS thermal insulation boards. 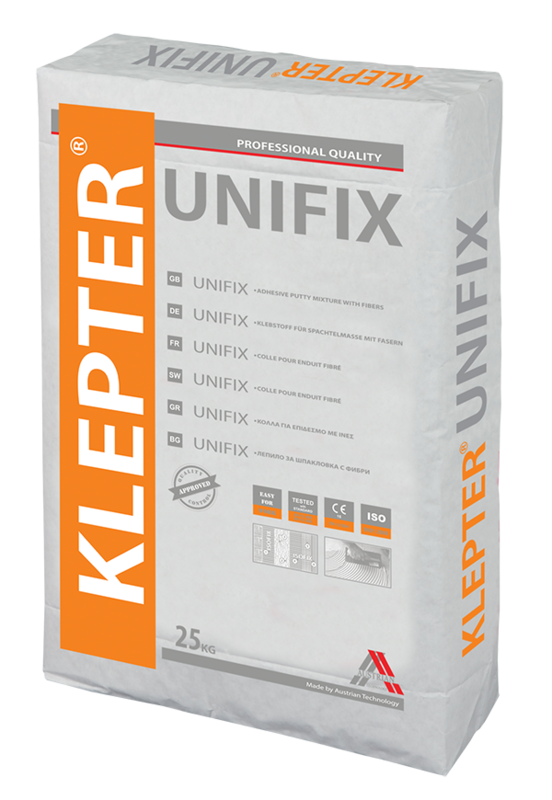 Suitable for installation of external wall insulation systems on new and old buildings. Excellent adhesion to the substrate, high vapor-permeability, water- and freeze resistant. The substrate must be dry, sound, well cleaned of dust and dirt. Primer must be applied beforehand on highly absorbent surfaces. Mix a bag of 25 kg of adhesive with 5.5 L of water. In a suitable container add the dry mix to the required quantity of water and mix with a mixing set for 10 min, then mix again and the product is ready to use. Important – re-stirring the mixture increases the strength indices of the product. If the substrate is smooth and even, apply the ready mixture on the whole surface of the insulation board with a square notch trowel forming ridges with the notched side of the trowel. If the substrate is uneven, apply the adhesive on the circumference of the insulation board forming a 4-5 cm wide strip, and apply “balls” of the ready mixture at several places inside this strip. For adhesion: from 4.0 kg/m2 to 5.5 kg/m2 depending on the size of the notches of the square trowel and how even the surface is. For plastering: from 4.0 kg/m2 to 5.0 kg/m2.